Several years earlier, the court official Su Wu had been sent by Han Wudi as an envoy to the Xiongnu (see Han Jie Cao). 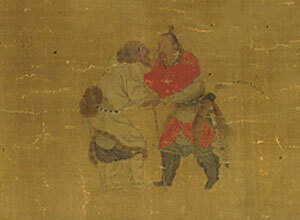 The Xiongnu detained Su Wu and tried to get him to work for them. They tried various methods, including having Li Ling talk with him (see image with Han Jie Cao), but Su Wu refused. In 86 there was peace and in 81, after 18 years in captivity, Su Wu was able to return to Han. His farewell to Li Ling (perhaps at a place as far north from Juyan as Lake Baikal) is another famous theme in Chinese lore, expressed in particular through poetry and art. Li Ling himself could never go home. He spent the rest of his life amongst the Xiongnu, dying amongst them 74 BCE. Wen Xuan has three poems attributed to Li Ling,15 plus a letter16 he is said to have written to Su Wu. Modally the scale is predominantly do re mi sol la with the main tonal center being la and secondarily mi. However, the last phrase in Section 9 ends with the note sequence mi flat - re - do. Then the closing harmonics, which are written out but are identical to those in the modal prelude, also end on and use do as the tonal center. Li Shaoqing lost his ambition amongst the fur (-wearing Xiongnu), and had no way to give expression to his loneliness and resentment. When Su Wu returned home (Li Ling) had a melancholy yearning for the homeland; this brought out his moral loftiness. 100 generations later, just hearing these sounds still causes people's hat and hair to stand on end (in alarm). 03.09 "and (repeat) Section 4"
14819.1082 李陵 has only Li Ling himself, no mention of music. For biographical information see Wikipedia and Loewe. For poetic references see below. There is a Peking opera called Li Ling Stele (李陵碑 Li Ling Bei) about a Song dynasty general who commits suicide by hitting his head against a stele commemorating Li Ling rather than surrendering to the northern invaders (compare Su Wu Miao). From standard tuning lower the third string. The 1539 version uses the same tuning but calls the mode Manjiao (lowered third). For more information on this tuning see Shenpin Biyu Yi and Modality in Early Ming Qin Tablature. The image above was extracted from the online version of a famous painting called Parting of Su Wu and Li Ling (National Palace Museum, Taiwan). For more on images with this theme see below. In a moment, — our parting will be over. Hesitating — we embrace where the fields begin. The source of this latter poem is perhaps 漢書 Han Shu; it is not in Wen Xuan or Yuefu Shiji. Perhaps a complete version (and translation) of the lyrics would deepen one's appreciation even for the 1525 version of the melody. For the poetic references see below. Zha's Guide Li Ling Si Han (16/167/363) has two entries; Han Jie Cao (22/194/380) has six, but #2 to #6 are all called 蘇武思君 Su Wu Si Jun. This grouping is presumably based on the statement under the title of the only surviving version of Han Jie Cao, which connects them (q.v.). However, the actual melody and lyrics of the later pieces entitled Su Wu Si Jun suggest that they have more connection to the 1525 Li Ling Si Han though, as the tracing chart shows, the melody of 1589 was quite new and most later versions copied that. 14819.1082 李陵 Li Ling 字少卿 style name Shaoqing. Biography in Loewe. See also in Wikipedia. The Xiongnu in general were a confederation of non-Han tribes, located generally north of the Great Wall but in a variety of places at different times in Chinese history. They were mainly of importance to China during the Han dynasty. During the early Han period the Xiongnu, though nomadic, were centered on their annual meeting place, 蘢城 Longcheng. For this 33170.2 quotes Shi Ji 110 匈奴, 111 衛將軍 and 112 主父偃 Zhufu Yan without clarifying its location, but seemingly suggesting it was near eastern Mongolia. Other sources suggest it was in the Koshu-Tsaidam region by the Orkhon River, which flows northward into Lake Baikal. one by Yun Ruo (1280 - 1359) entitled Li Ling Si Han. The poems by Yun Ruo (which mentions 5-character verse) and Xie Ao are 7x4; that by Chen Qiuyan is quite lengthy. None of these poems sheds any light on the actual music. Images from folk art such as the one under Han Jie Cao. Shi Ji #109 (中文, pp. 2867-7877; Watson translation, RGH II, pp. 117-128,) has Li Guang's biography and that of several descendents, including Li Ling; the account in the above paragraph comes from this source (中文, p. 2877). Watson (p.128, fn.4) says the end of Annal 109, including comments attributed to Sima Qian praising Li Ling, was a later addition. See again Shi Ji Annal 109. This vast area encompasses much of northern Xinjiang and western Inner Mongolia. However, the area where Li Ling ventured seems to have been generally northeast of Dunhuang: the account says he was finally cornered by the Xiongnu after he led troops from his base in Jiuquan to within about 100 li of Juyan. As a prisoner and then in-law of the Xiongnu ruler Li Ling may have spent much of the rest of his life around here, but also could have lived quite far from here (see Xiongnu above and note that Su Wu is sometimes said to have spent much of his exile near Lake Baikal). Jiuquan ("Wine Spring") is a city in central west Gansu just north of the 祁連 Qilian mountain range (see below); its name is said to come from a story that General Huo Qubing poured wine into a local creek to share with his troops celebration of a victory over the Xiongnu around the year 120 BCE. Along with 張掖 Zhangye about 200 km east southest, it was the base for the western Han armies. Shi Ji has Li Ling stationed at both Jiuquan and Zhangye. 7838.43 居延 Juyan says it was a commandery in Jiuquan, in the vicinity of the 額濟納旗 Ejinaqi (Ejin Qi, Eiin Qi). The modern city of Ejinaqi, near 42°N, 101°E, in what is today westernmost Inner Mongolia, is said to have been near a main Xiongnu base. It is about 500 km east northeast of Dunhuang, with the modern city of Jiuquan about 300 km from each. There is today a 祁連省 Qilian district in the Qilian mountain range running just south of Dunhuang, Jiuquan and Zhangye, along the border between Qinghai and Gansu provinces. However, some old works suggest Qilian represented the Xiongnu name for 天山 Tianshan (Heavenly Mountains). This is a vast mountain range running east west in central Xinjiang province. Juyan is about 500km east of its eastern end. It thus seems that the story connected to this qin melody largely takes place in what is today western Inner Mongolia and central Gansu. After Li Ling surrendered, the only person who defended him at Han Wudi's court was Sima Qian, who as a result was given the choice of honorable suicide or shame and castration; he chose the latter so that he could complete his history of China, the Shi Ji. 14. A net search for "Li Ling" "Su Wu" gives more detail. All were written in 5-character (pentasyllabic) lines. Giles credits 嚴羽 Yan Yu (ca. 1200) with saying Li Ling invented pentasyllabic verse, perhaps based on these poems. However, most critics now doubt the attribution of these three poems to Li Ling himself. All concern his parting from Su Wu. 努力崇明德，皓首以為期。 The first line of the third poem can be translated, "(We) clasp hands on the river bridge, (but) the traveler by nightfall will be where?...." It thus identifies this as a farewell to Su Wu: both 17634.129 河梁 heliang "river bridge" and 17634.130 河梁别 heliang bie "parting at river bridge" most clearly connect this expression with Su Wu parting from Li Ling. However, this interpretation would make "river bridge" out of place as title to Section 3 of Li Ling Si Han: for the purposes of this melody "river bridge" should refer to Li Ling leaving Jiuquan to pursue the Xiongnu. In fact, an alternatve explanation of 17634.129 河梁 heliang says it is 詩篇名 the name of a poetic essay, quoting from the Spring and Autumn Annals of Wu Yue (吳越春秋 Wu Yue Chun Qiu) a passage about departure at a river bridge to attack the 秦王 Qin king ("渡河梁兮渡河梁，擧兵所攻伐秦王。"). It has been translated by Giles; see, e.g., Herbert Giles, A History of Chinese Literature; NY, Grove Press (originally 1923; Evergreen Reprint, 1958? ), pp.84-9. See QQJC III/191 ; I haven't found its source. this melody only here; "alternate title Su Wu Si Jun"
Return to top, to the annotated handbook list or to the Guqin ToC.